According to French senator Yves Pozzo di Borgo, who visited Crimea together with a group of ten French legislators, US propaganda over Crimea is understandable even though it does not reflect the peninsula's realities. French parliament member Jerome Lambert, who visited Crimea together with a group of ten French legislators, told Sputnik that the visit showed that US propaganda over Crimea is understandable even though it does not reflect realities on the peninsula. "The US is trying to deploy in Europe and counteract Russia. The American point of view is understandable. And when there is an understanding of this, there are explanations to American propaganda, the propaganda of some US allies in Europe," Jerome Lambert said. 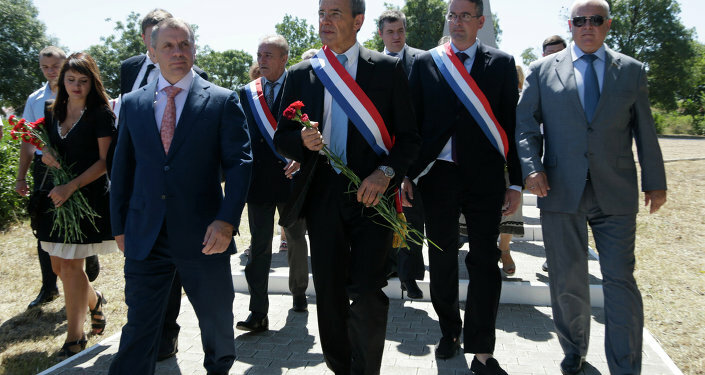 The French lawmakers, led by lower-house National Assembly Foreign Affairs Committee member Thierry Mariani, said they came to Crimea to get a real sense of what is really going on in the Black Sea peninsula. During the July 23-24 trip, the parliamentarians visited Crimea, where they met with government officials. "When Mariani suggested that I visit Crimea, I told myself that I have to go and see it with my own eyes. What is the point of discussing something at parliamentary assemblies if no one went to see what is actually going on," one of the visiting legislators, Yves Pozzo di Borgo told Sputnik. Pozzo di Borgo said that he initially received an impression from French media that there is a war in Crimea and that everything is "horrible." According to another visiting French legislator, Jerome Lambert, the situation in Crimea is normal and he saw many tourists in Yalta. "We met hundreds, thousands of people, many of whom talked to us, many thanked us for coming, for our interest in the Crimean sitation, for the reestablishment of a normal status because the current situation is not normal due to the embargo, and so on," Lambert told Sputnik. Pozzo di Borgo said that the legislators will talk about what they saw when they return to France, and hopes that European Parliament members will also visit Crimea to see what is happening there. According to Pozzo di Borgo, European diplomacy cannot truthfully inform people about Crimea, putting it into a sort of "black hole," which he compared to Cuba's relationship with sanctions. "We should not repeat Cuba's experience, which stayed in a black hole for 50 years, as Mariani said. But there is hope that Crimea won't stay there. I personally hope that the Minsk agreements will be followed, after which it is necessary for Ukraine and Russia together with the EU to look at how the Crimean issue can be resolved, because people live there, two million residents who are right now in this black hole," Pozzo di Borgo told Sputnik. According to Pozzo di Borgo, Europe must act as a "civilized continent" and not impose an embargo on Crimea as the United States did to Cuba for 50 years. Legislator Patrice Verchere told Sputnik that relations between Russia and France are icy right now because the French government chose to make them so. "France must find a balance in this relationship. General de Gaulle taught us that France's greatness is in trying to understand all sides in difficult conditions," Verchere said. According to Verchere, France must resume dialogue with Russia to attain its previously warm ties. He also added that among friends it is possible to talk about both the positive and the negative, which France must attempt to do.